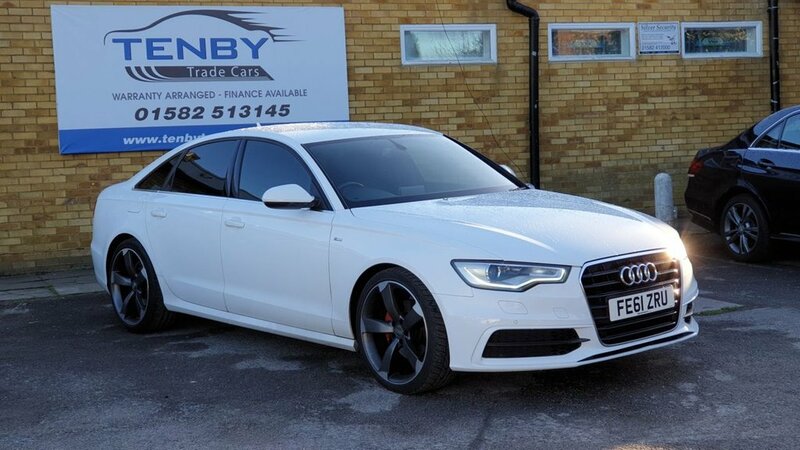 AUDI A6 2.0 TDI S LINE 4d AUTO 175 BHP WITH FULL AUDI SERVICE HISTORY ! CAMBELT KIT AND WATERPUMP CHANGED AT 85000MILES. COMES IN GOOD SPEC INC : -SAT NAV -FULL LEATHER -XENON HEADLIGHTS WITH WASHER -BLACK LEATHER -4 WAY ELECTRIC LUMBAR SUPPORT -DUAL CLIMATE CONTROL -START STOP SYSTEM -AUX IN -CRUISE CONTROL -BLUETOOTH -AUTO LIGHTS -AUTO WIPERS -FRONT AND REAR PARKING SENSORS -ELECTRONIC PARKING BRAKE WITH AUTO HOLD -LEATHER STEERING WHEEL WITH SHIFT PADDLES -CLEAR HPI PLUS MORE!